I've been getting this free Kraft What's Cooking magazine quarterly for a long time. They stopped taking subscriptions a few years ago, and I was so thankful to be one of their subscribers. 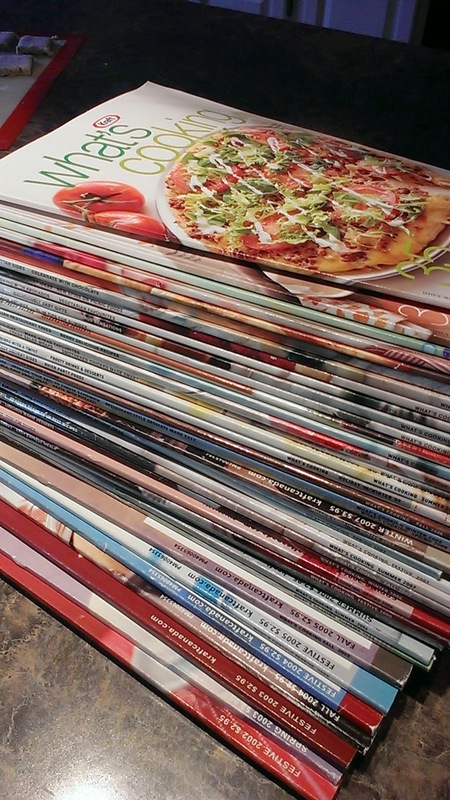 When the magazine came in the mail, I just loved looking at the common sense recipes and had big plans on what to cook out of it. it would sit on my cupboard for days, maybe even weeks... and serve as inspiration for some meals when I was too tired to think... I have magazines from back in 2002. That's 13 years. It's time to pare down. I use the Kraft What's Cooking website often and I know I can find any of the recipes online. I really find that I'm heading to my computer more and more for recipes. 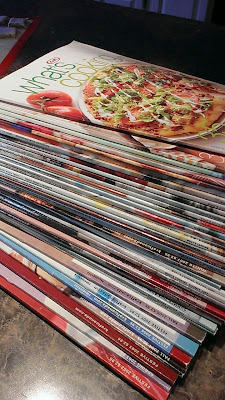 So these magazines will be bundled up by year, and put into our quilt guild's yard-sale style silent auction in a couple of weeks. I know who ever buys them, will be inspired for days and lucky will be the ones who are around for her cooking!! Another milestone. 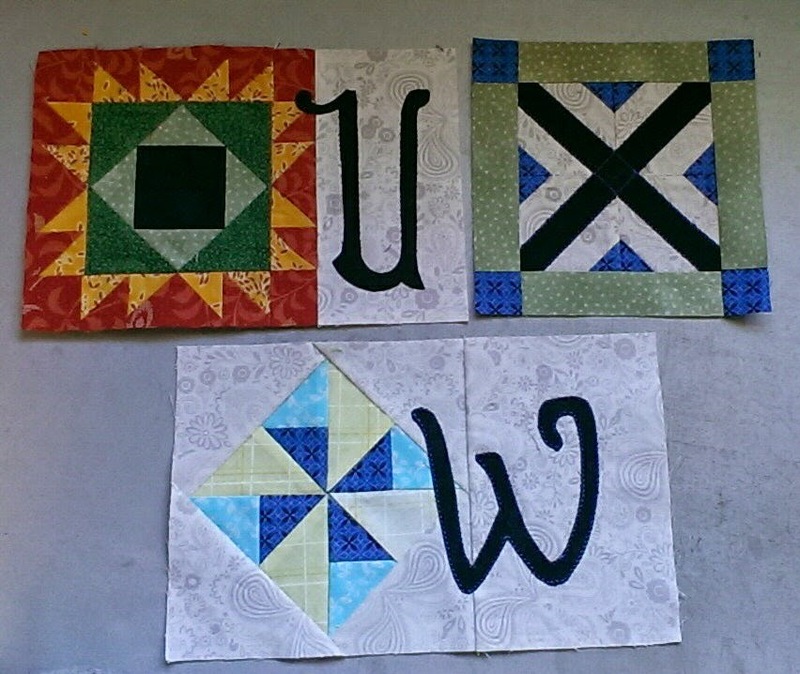 All 26 blocks to my A - Z quilt are done. I'm really happy. The final three blocks weren't that bad to do. I don't know why I was putting it off so long. 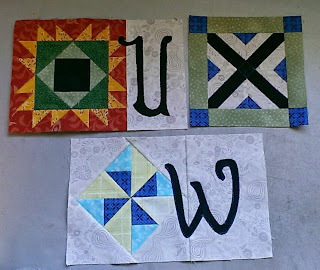 I will add the sashing and sew the entire row of blocks together. It comprises the bottom third of the main body of the quilt. My next challenge is to work on the very detailed borders. I know that I'm going to have to carefully plan a strategy to get them done. They'res only 4 side borders. Maybe that will be my June weekly challenge to myself. I enjoyed making this cute project. 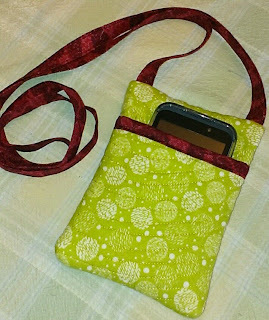 I'm using it for a phone holder when I go for my morning walk. 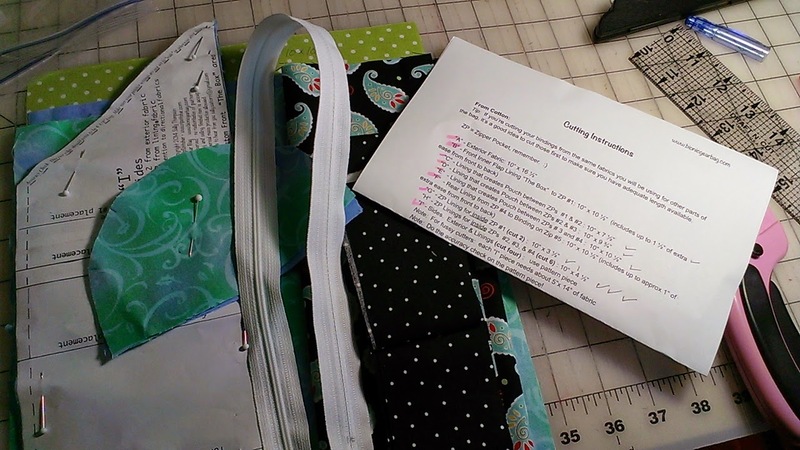 The instructions have this badge holder hanging around your neck but I made a 50" cross body strap instead. I'll wear this prototype today to carry my phone in it while I walk. I think the size is right on. My phone fits perfectly inside the zip section or in the back slot. This project didn't take long at all. Maybe an hour or less. The key is to pre-quilt a 12 x 12" piece of fabric. Then cut it into the required size pieces. Next time I make this, besides using a coordinating zipper color :), I would not bother with the badge holder plastic in the front. It made it hard to turn inside out and I'm not using it for a conference so it's really not needed. Want to make one for your self, check out this tutorial. I came across this recipe on Pinterest this week. It's a Quaker Oats recipe that was on the top of a canister of oatmeal. 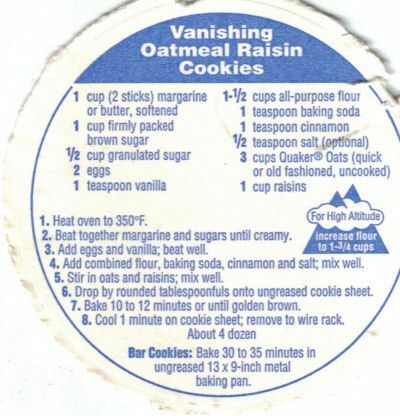 I've tried many oatmeal cookie recipes and I can't seem to find one that cooks up right for me. 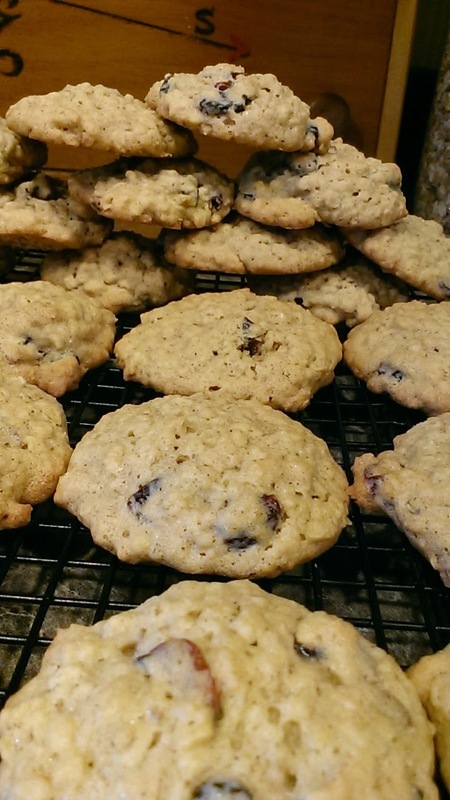 Even my sisters fabulous oatmeal cookie recipe which comes out great for her, is bla and flat when I make them. I gave this recipe a try the other day. And the cookies came out better than most recipes that I've tried. I like that they don't flatten out to much. My husband says the are just fine. Actually I make them for him and not me. This recipe makes a nice big batch, and next time I'll double the cinnamon. 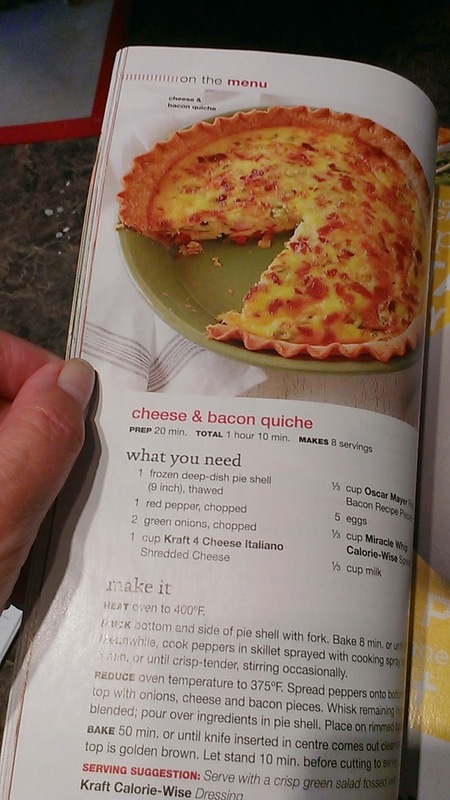 So I think I'll stick with this recipe for now. When I was at the Keswick Ridge Quilt Guild on Saturday, one of their sweet members brought me a handmade gift. 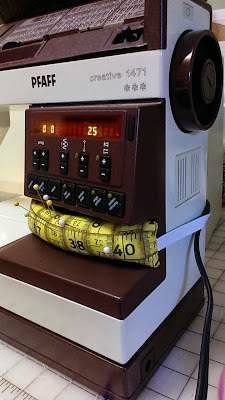 It is a pin cushion that wraps around my sewing machine. It's so practical. Thanks so much Susan. It's a perfect fit for my old Pfaff machine and I love it. 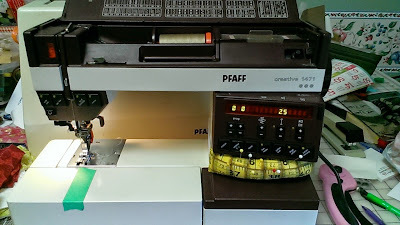 to fit perfectly into the groove of my machine. I'm so impressed. We had a great day in Keswick yesterday. 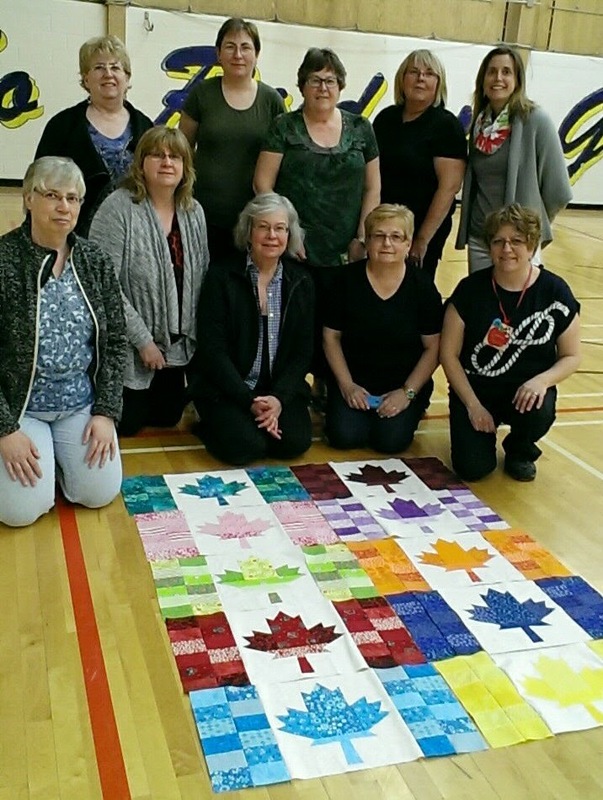 I led a fun fabric swap class and these ten gals from the Keswick Ridge Quilt Guild will be soon waving their special flags on Canada Day! I can't wait to see if one of them will have their quilt done to show at their upcoming quilt show in two weeks. 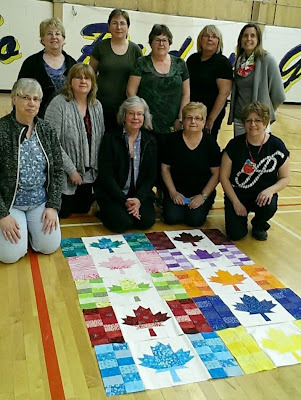 If you didn't hear about The Keswick Ridge Guild's Quilt Show, it is May 22 and 23rd at the Riverside Inn and Resort, Mactaquac. Friday 10-8 and Saturday 10-4. There will be Vendors and a Kings Landing Trunk Show. Doesn't that sound inviting!. I know I'll see many of you there when the doors open on Friday morning. I have a small plot at a local community garden. I love it because there's a fence around the whole garden and it keeps out the deer and other animals. All the plot owners are expected to support the gardens by volunteering. I've had some fun jobs. This week, the community gardens organization have some exciting news. 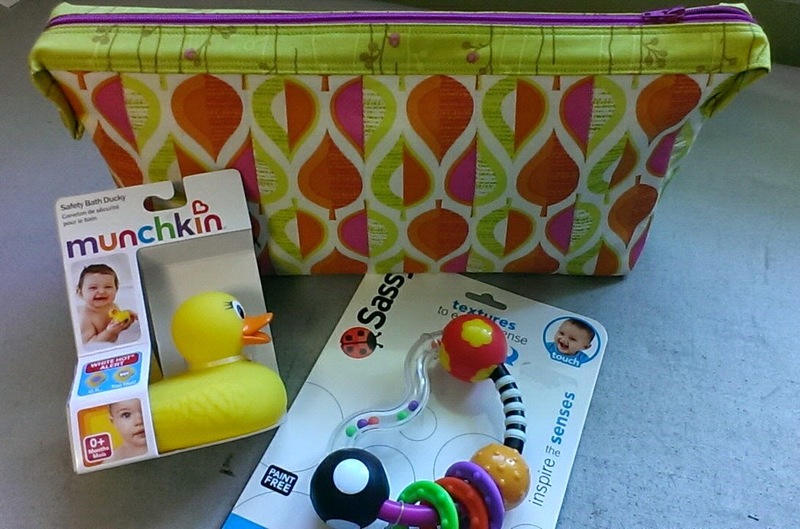 They have been given space in the Fredericton Public Library for their seed library. The official opening of the Seed Library is this Friday. So that means, this past weekend, a small group of volunteers prepared small packets of seeds that will be stored in the Library and will be free to those who want them. 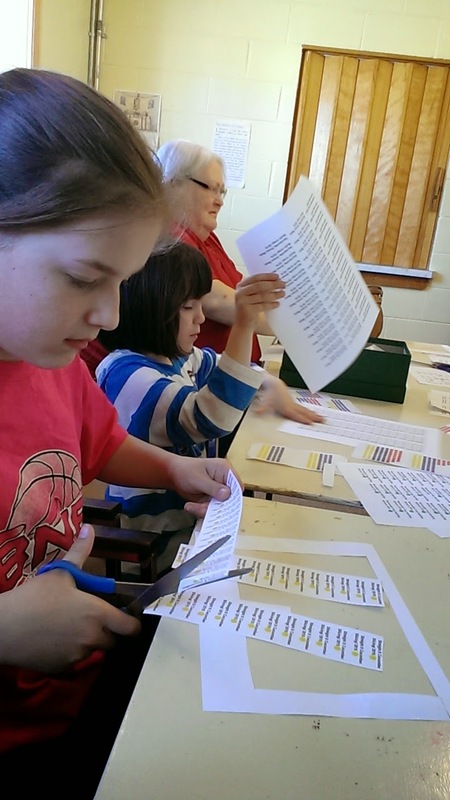 Caitlin and Aurora came with me last Saturday to help to prepare the seed packets. They really did help a lot. Aurora stuck colored dots on the seed names. The different colors indicate how easy or hard the vegetables are to grow. Caitlin cut out the individual labels that will go in the bag with the seeds. Then we all counted and bagged seeds. The other volunteers were pretty appreciative and impressed with the girls hard work. Later on after our volunteer work was done, the kids were eating an orange for a snack. 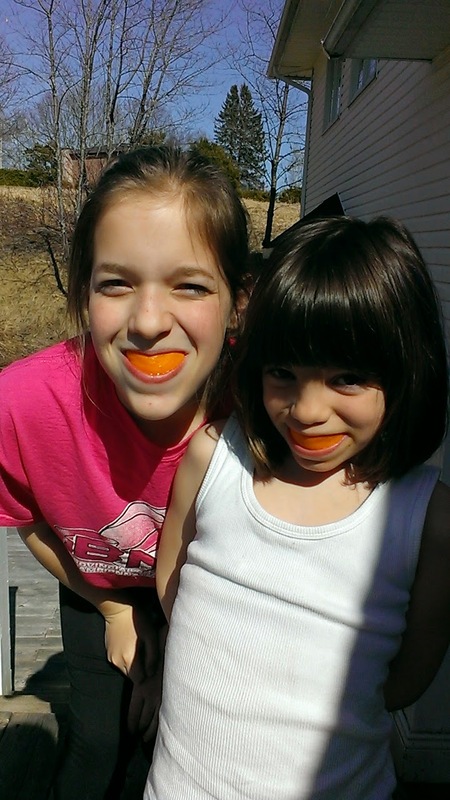 Who can resist using your orange wedge as a mouth guard! The kids came over for supper last Sunday. We had a lovely supper. 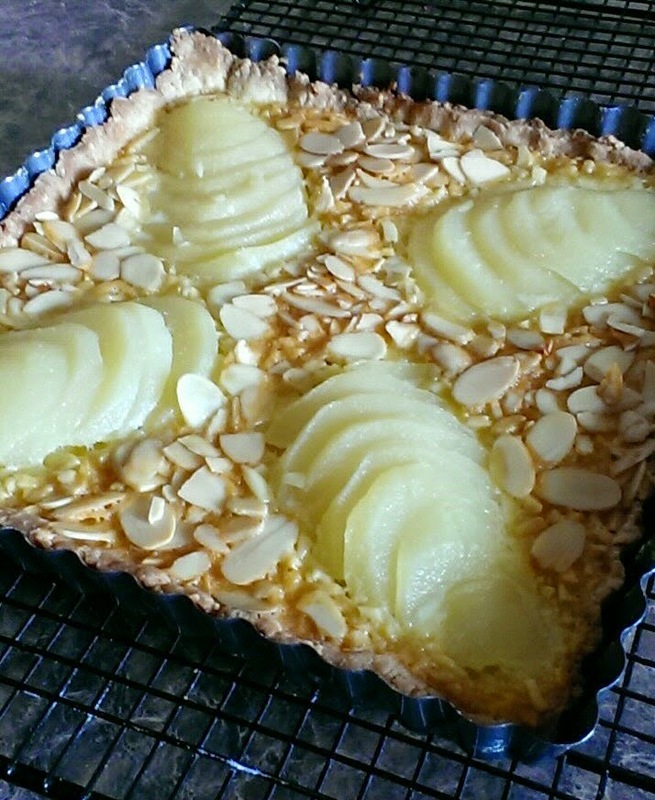 I came across this French Pear dessert on pinterest and thought it would be nice. I made it and totally missed the instruction that called for a hot glaze. So it's not shiny. I'll do that next time.. But it was delicious. It was a little weird to make it. The recipe follows. Besides being translated by Google, can you see what is odd about the recipe. In a large bowl place the flour with the icing sugar, butter and almonds, grind everything with your hands until a "crumble". Add the egg and work the dough until it is mixed well. Shape into a ball, flatten and film, refrigerate. Whisk together all ingredients for the almond cream. Preheat oven to 160 ° C (180 ° C with my mom, so depending on the power of your oven you choose the better). Roll out the pastry on floured surface and line the pie pan. Spread the almond cream on the pie shell. Finely chop the pears, lift them with a knife, look slightly with the palm of the hand and place them on the star-almond cream. Spread the almonds on the visible dough and bake for 30 to 40 minutes, until the pie is golden. While professional bakers wouldn't have it any other way, I found it weird to be weighing all my ingredients instead of using my standard measuring cups. And if you want to know how much 30 gm of egg is, it's half an egg. 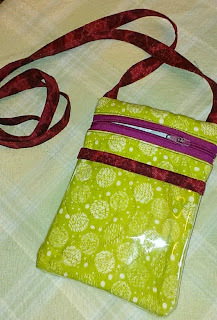 In March, I made a Bionic Bag out of scrappy on-hand fabric to test out the pattern. I like it. 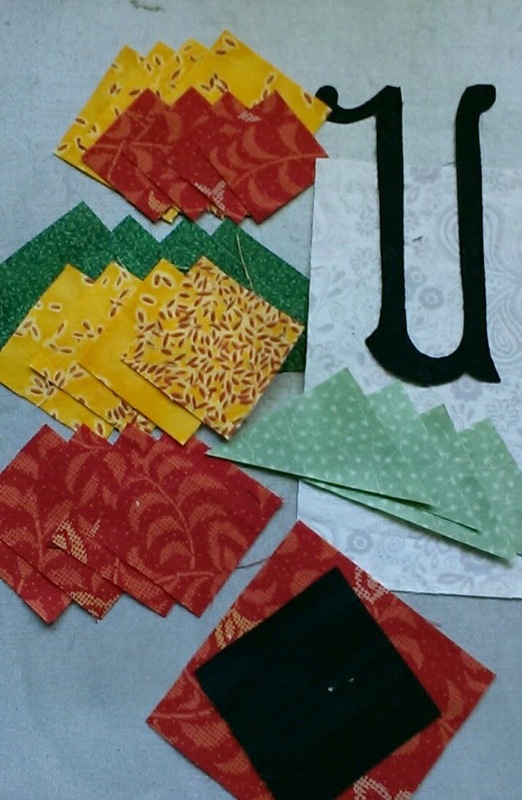 I bought fabric to make another and before it gets way down on my to-do list, I thought I'd cut out the kit. There are lots of pieces to prepare for this project. 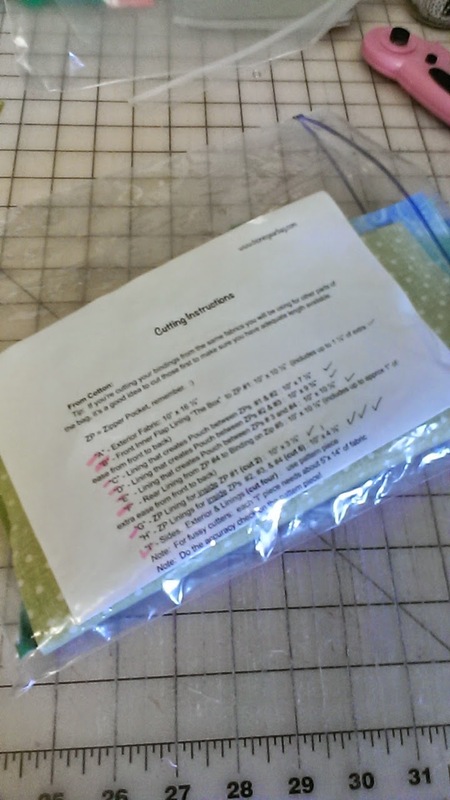 I find it easy to print the cutting page, and tick off the cuts as they are done. It doesn't look like much in this baggie, but there's a good hours worth of preping fabrics, matching colors, cutting, etc. I'll buy the zippers, and then it's ready to sew up. You know, I find it cathartic. After all that, I am all pumped up to make this now. Over the past year, I've been leading wallet classes. The class participants have been making the wallets out of Batik fabric since it's just plain nice, it's a nice tight weave, and there is little or no direction to it. 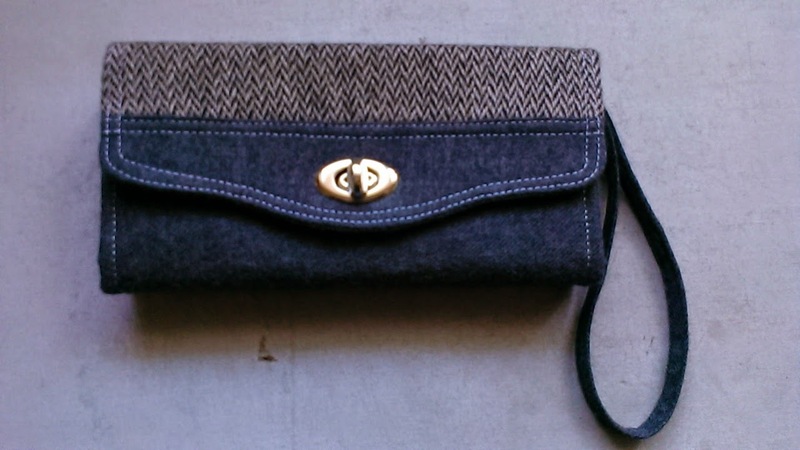 These Winter Wallets are made from the same pattern, but have a totally different yet pleasing look. They are made out of recycled wool, mostly from old men's pants or jackets. Most of the focus is on the flap, so it's fun to figure out a simple design. They feel so nice to carry. 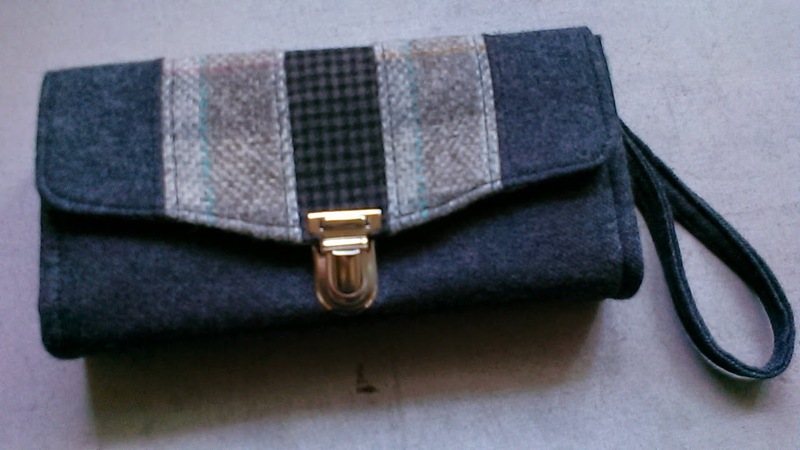 If you have any old wool suits you'd like to recycle, why not try a wallet?